Today we’ve a few Bits & Bytes to share, beginning with word about C. Wonder’s new store on the upper west side. The soft opening is under way already, but the grand opening fun is this weekend. There are seven stores in total now, this is the new flagship store located at the Time Warner Center. C. Wonder’s second Manhattan store is like the original SoHo unit on steroids. The 8,000-square-foot space… has more color and more props — including life-size multicolored striped zebras, polka-dot horses and six-foot logo teddy bears. There’s even an illuminated portal at the entrance with LED lights projecting the brand’s proprietary print. We have been getting mixed review on the brand’s merchandise, with some reports that apparel items in particular are not holding up well, others saying they’re fine. According to the WWD story, CEO Christopher Burch says he has been focused on raising quality. Hmmmm. The new outpost does look like fun, the splashes of color are always a delight. Our other tidbit today is a tip of the hat to the folks at Brooks Brothers; heaven knows we beat up on them heartily enough we have occasionally mentioned a concern about an item or two (cough-cough). We are way behind in reporting this, but the retailer is donating suits valued at $1 million to the Dignity U Wear program, a partnership with the Wounded Warriors project. The idea is to make professional wardrobes available to wounded veterans so they can find jobs in the civilian workforce, a daunting task. In addition to the clothing donation Brooks is also helping raise cash, they hosted their first fundraiser at the New York mothership in June. Montel Williams was a powerful guest host… virtually moving the crowd to tears with his story. Returning from several years in active duty overseas, he had saved up what money he could find to buy some decent clothes for job interviews. While interviewing (for a job he didn’t get), he realized he was competing with guys in nice suits and ties and felt, whether true or not, that he could never succeed without the right clothes. 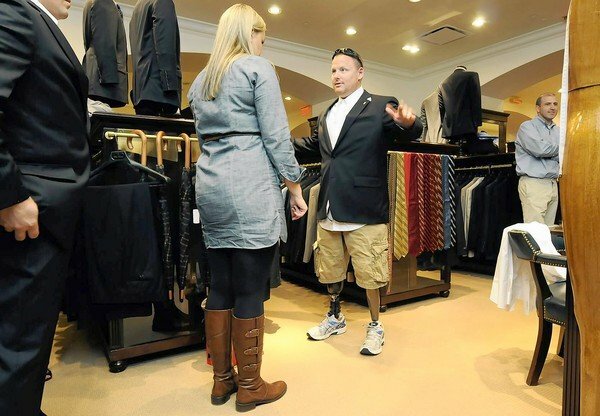 Some vets received suits recently as part of their UConn Entrepreneurship Bootcamp for Veterans with Disabilities, below we see Marine veteran Jared Luce being fitted at the Brooks Brothers in W. Hartford. Dignity U Wear actually targets three groups in need, Women and Girls in Crisis, Veterans, and Learning With Dignity. Below, boxes of clothes headed to a Boys and Girls Club. Today seemed appropriate for talking about this, it is National POW/MIA Recognition Day. The photo below is from the Wounded Warriors Facebook page. The fall Dignity U Wear gala is October 25, you can learn more about it here. Happy almost weekend, a touch of Friday Fun seems in order today, hopefully you will agree. They replace a range of “mocha brown” and black uniforms that were introduced four years ago. He said the look, with skinny ties for the male managers, pencil skirts for the female managers, and Fred Perry style polo shirts were inspired by a mixture of the 1960s mod movement and Mad Men, the American television programme set in that decade. Even at staid Brooks Brothers, a publicist promoted “Eight Shades of Grey Ties” among their offerings. “We may not have Fifty Shades of Grey Ties, but we do have Eight Shades of Grey Ties,” he wrote The Post, forwarding a link to a collection of neckwear that retails from $44.50 to $175. Those familiar with Fifty Shades won’t be surprised to learn other things related to the book are also selling well. Unmentionable-type things. We leave you an early “How Hot Is It?” Even though it is only June, so many friends are coping with extreme heat we decided to pull this one out of the archive. … this is an “un-posed” picture (trust me, you couldn’t actually make Elliot do anything) of said pooch trying to beat the TEXAS heat after his owners emptied their cooler in the driveway in Lamesa, TEXAS. Another bullie, Honey Ham, cools off with a dip in her pool. Yes, Honey really swims, you can see her doing her favorite stroke (dog paddle) in this video clip. We think of Honey as the Ryan Lochte of swimming bullies. Today’s post is a bit of a departure from our normal fare. For months we have chatted with friends about those ubiquitous flash sale sites, a phenomenon almost unheard of until the last several years. Usually we talk about upcoming sales, new or different sites, and how good the bargains are; lately the conversation has focused more on that last theme. I finally decided to explore the topic, hoping it will provide a modicum of entertainment, perhaps you can even share input and insight from your own experiences. But then These Troubling Times arrived. When the Great Recession hit, stores were faced with enormous amounts of unsold merchandise that was discounted, then discounted again, and perhaps several more times. In many cases it still didn’t sell. This was particularly true for luxury retailers, they had racks overflowing with merchandise no one wanted, or could afford to buy. “The original flash sales model for the U.S. exploded during a time when there was this huge abundance of excess inventory,” said Steven Dennis, founder of SageBerry Consulting and a former executive at retailer Neiman Marcus. Gilt is credited with launching the first flash sale site in the US, but others soon followed. And they continue to follow, as explained in this story from The Business of Fashion. For those unfamiliar with the flash sale sites we share a brief primer. They are referred to as “members only sites,” a term generally excoriated occasionally questioned in this space, as most anyone with an email address can “join”. Once signed up, daily emails are sent with a list of that day’s offerings, as well as a preview of upcoming sales. Below, the Haute Look landing page. Most sites require that you sign in before showing whatever sales they are offering, although not every site requires a log-in immediately. Here is another home page example from Zulily, a site specializing in merchandise for “Moms, Babies and Kids”. Once past the sign-in page you see the specific sales in progress. A glance at Beyond The Rack’s sale events underway last Friday shows Burberry, Coach, and “limited edition pre-owned Chanel” among the offerings. There are even “prep-centric” flash sale sites, like Five Mile. Brands offered by Five Mile are familiar to many a prep: Knot Belt Company, Southern Proper, Castaway, Salmon Cove, to name only a few. The broad range of delivery dates serves as a reminder shoppers need to pay attention to the fine print, especially if making a time-sensitive purchase like a gift, or something for a special occasion. One more caveat: popular brands, such as Lilly Pulitzer, sell out very (*very*) quickly. It is not unusual to see items marked as “sold out” less than a minute after an event has started. The explosion in sites has been enormous, the marketplace is now crowded. Some of the larger companies like Gilt have expanded into new terrain with specialty shops like Gilt Taste. Home furnishings flash sale site One Kings Lane recently announced the addition of Vintage & Market Finds, where a selection of marked-down furniture, accessories and art are available for five days at a time as opposed to its usual 72-hour time frame and new items are added daily. Email fatigue is one of the biggest challenges flash-sale sites face. Emails are the primary way of disseminating deals, but after a while web shoppers can tune out and unsubscribe. This was even more true as more flash-sale sites came on the scene and as active shoppers subscribed to more than one flash-sale site. “It has gotten to be an incredibly crowded marketplace, and there is the risk that all these offers can overload consumers,” said Stephen Wyss, a partner in the retail and consumer practice at BDO. With stores becoming far more savvy in what (and how much) merchandise they order, there has been a steep decline in the availability of all that bargain inventory, especially luxury brands. One outcome is the growth of themed sales, no longer grouping items just by brand or designer, but by theme. Merchandise may be grouped by season, like “Flirty Tops for Summer” or “Backyard BBQ Essentials”. There are even manufactured sales, such as an event Gilt held the second week of May, a sale titled “Revenge: Emily’s Beach House,” playing off the popularity of the TV show. The Hamptons was Emily Thorne’s old neighborhood, until something happened that destroyed her family and their reputation. Years later, she has returned to right those wrongs. While it’s a lot smaller than Grayson Estate next door, Emily’s beach house is no shack. It’s the epitome of laid-back yet luxurious East End style. This sale includes authentic props from the set of Revenge; the most well-known is the porch swing, originally built by Emily’s father. You’ll also find the pedestal table found on the patio, and a candlestick from the living room. We’ve complemented these props with accents, from artful dishware to sconce lights. Retailers have fought back by jumping into the arena, doing their own flash sales. Below, a screen grab of an email I received from Neiman Marcus. Another example, Brooks Brothers did a limited time sale this weekend offering up to 75% off its Black Fleece line, the following image is from a Brooks Brothers email promoting the sale. It isn’t just upscale retailers taking part. And some have moved their outlet stores online as well, J. Crew “opens” its online factory store during the weekend. Another rapidly growing area is Facebook, many start-ups are offering flash sale sites on their fan pages, especially jewelry vendors. A photo of an item is shown, and the first shoppers who enter a comment saying they want the item are able to purchase it. Again, the sense of limited merchandise and a short time span prompts buying from those who don’t want to “let it get away,” or be “left out,” with actual financial transactions generally handled off-site. We have been fortunate with many of the sites and made some *marvelous* purchases over the years, particularly back in the early days of the genre. Good products, great prices and solid service. Later this week we’ll have Parts 2 & 3, looking at some of the more preppish brands sold on the sites, as well as an examination of just how good the deals really are these days… or not. ADDENDUM: If interested in signing up for any of the sites, here are links to some where I have shopped *and* enjoyed a positive experience. Another interesting facet of the flash sale business model are the varying rewards offered for those referring customers, most offer merchandise credits of anywhere from $10 to $25 if someone uses your invitation link and also purchases something. It’s the time of year where one holds fast to the knowledge that even if we see more snow, spring isn’t *that* far away. Naturally yours truly begins to think about spring fashions at this point,we thought it would be fun to take a peek at some of the offerings this season. Brooks Brothers continues to offer its updated take on classic pieces. 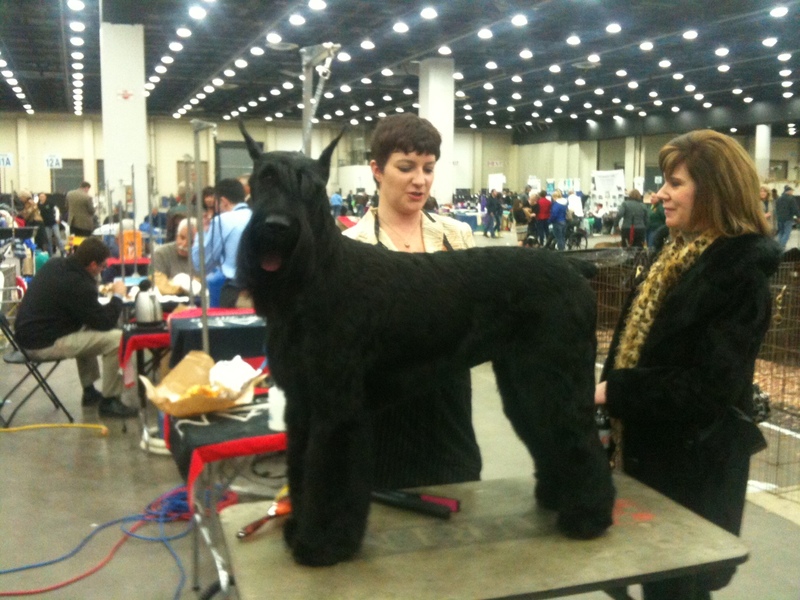 A number of styles were very attractive. Although the shorter, more cropped fit on sweaters has yet to resonate here at the Prepatorium, other items hold promise. The retailer’s Black Fleece collection features a number of pieces we liked. And some bright colors. Very. bright. colors. There are also enticing styles for the Young Miss at your palace. There seems to be a lot of green in fashion palettes this spring. The offerings in the Boy’s department look solid. These argyle sweaters will certainly work for the growing number of women who buy Boy’s XL sweaters. Accessories include new bags as well, some evocative of a man’s repp tie. There are also new totes, including madras and Liberty of London prints, the Liberty bags are reversible. The Liberty prints can also be found on women’s espadrilles. Over at Milly the patterns are equally fresh and vibrant, especially for the spring Girl’s collection. The turquoise, navy and salmon is an appealing color combination. The spring Sperry Top-siders that Michelle Smith designed are in stock, the navy Links print is probably my favorite. These are available for both big and little misses.